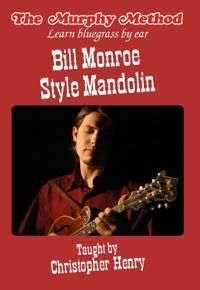 Bill Monroe-Style Mandolin: Bill Monroe, the Father of Bluegrass, is also the father of the Monroe-style of mandolin playing. Our son Chris Henry—who has been called a “fire-eating Monroe acolyte”—grew up on the sounds of Bill Monroe, not only from records but from the sounds of his own father’s playing. (With some David McLaughlin thrown in for good measure.) In other words, Chris knows the Monroe style. Having grown up in a Murphy Method home, he also knows how to teach it, note by note. Here we present four Bill Monroe tunes along with a bluesy Monroe-style break to “Man of Constant Sorrow.” If you’re ready for some hard-core bluegrass mandolin playing, you’ve come to the right place! No Tab. 83 minutes. Big Mon, Bluegrass Breakdown, Raw Hide, Wheel Hoss, Man of Constant Sorrow.